With Famepushers funds increasingly thrown at the Brinsleys – including the infamous hyping of the band in New York, Help Yourself, together with John Eichler and Dave Robinson, left the organisation. The duo set up Down Home Productions – their early publicity blurb describing them as ‘a loose family of artists and creative people’. Down Home got Help Yourself a record deal with Liberty Records, signed by the label’s head of A&R Andrew Lauder. They recorded their first album (above), with Dave Robinson producing, in and around Christmas 1970. A single, coupling ‘Paper Leaves’ with ‘To Katherine They Fell’ was also issued. Neither sold in huge quantities, although the album was successful enough to allow the band to buy some more professional equipment and start playing gigs – most notably on the ‘Down Home Rhythm Kings’ package tour together with Brinsley Schwartz and Ernie Graham. In an ancient now lost in the mists of time, Ken Whaley was sacked after the tour… but was to return later! A track from the album, entitled ‘Street Songs’, was included on a United Artists sampler called ‘All Good Clean Fun’. A tour to Switzerland was set up to promote the compilation LP, which included the Leicester band Gypsy and the Welsh band, Man. The tour marked the start of a long-term friendship between the Helps and their Welsh counterparts. The following year, in 1971, together with Ernie Graham and his guitarist Jonathan ‘Jojo’ Glemser, the band moved into Headley Grange, the house in Hampshire where Led Zeppelin, the previous year, had recorded their famous fourth album using the Rolling Stones mobile studio. Graham and Glemster were amalgamated into the band – and Treece (the band now having a surfit of guitar players) switched to bass. 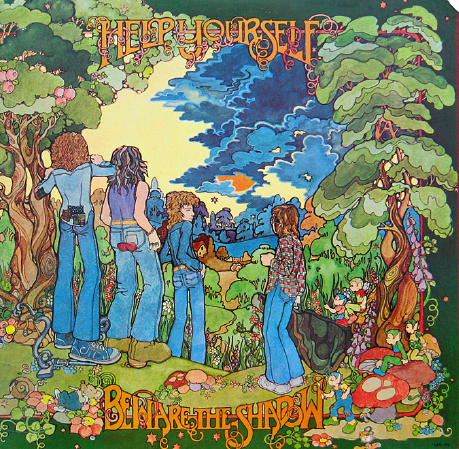 The band’s second album ‘Strange Affair’ was written and recorded at Headley Grange in an 18 month period during 1971 to 72. However, Graham and Glemser left the band during the recording, leaving Richard Treece (who had started the album playing bass) to complete the guitar parts. Roadie Paul Burton took over bass duties. 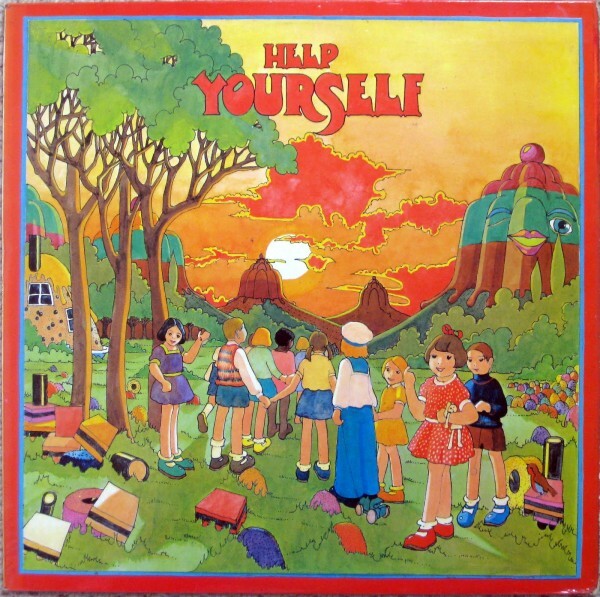 The Headley Grange period also marks the brief introduction of another character in the Help Yourself story – Sean Tyla. The American guitarist and vocalist lived at the Grange before they decamped back to London. While at Headley Grange, Sean Tyla conceived the story of the ‘All Electric Fur Trapper’ which appears on ‘Strange Affair’. Note: on returning to London, Tyla formed the band Ducks Deluxe with… Ken Whaley! Returning to London was good for the band, and 1972 was in retrospect their busiest and perhaps most successful year. Their third LP ‘Beware The Shadow’ (below) was recorded at Rockfield and mixed at Olympic. Malcolm remembers it being done in three or four all-night sessions. The band even managed to get out on the road and promote the LP. ‘She’s My Girl’ was chosen as a single from the LP – Pete Townshend reportedly hearing the mixing session and saying that it “left you wanting more”. Praise indeed! A second single was released at the end of the year – ‘Mommy Won’t Be Home For Christmas’ with a live version of Johnny B Goode on the B-side. The latter had been performed by the band at a John Peel ‘Sounds Of The Seventies’ session on 25 April (transmitted on 19 May). Recorded in Studio T1 at Kensington House in Shepherd’s Bush, in addition to the Johnny B Goode cover, the session also featured ‘Re-Affirmation’ and ‘Let it Roll’. A further track ‘While Away’ is listed by the BBC archives as being recorded on 30 June. The band also appeared at the Glastonbury Festival – with Man guitarist Deke Leonard standing in for Malcolm Morley. “It came about because I lost my nerve and couldn’t face the music. The ‘Black Abyss’ loomed. We cancelled a gig in France after Dave Charles had failed to snap me out of it” recalls Malcolm. As luck would have it, Deke Leonard was living with the band at a house in East Finchley, and he boldly stepped in to fill Malcolm’s shoes. With Malcolm soon back, the year was nicely rounded off by an appearance at Man’s Christmas party at the Patti Pavilion in Swansea on 19 December. Help Yourself were joined onstage at the gig by both Deke Leonard and BJ Cole (the accomplished pedal steel payer) for a jam based around a Deke-penned track entitled ‘Eddie Waring’. The gig was commemorated by a double ten-inch LP (above). In February 1973, Ken Whaley returned to the fold and Help Yourself were back to their original line-up. Paul Burton joined Deke Leonard’s Iceberg. Revitalised, the band recording two-LPs – ‘The Return Of Ken Whaley’ plus the eclectic ‘Happy Days’. The latter was a collaborative effort with the Flying Aces (Man bassist Martin Ace and his wife George, plus Vivian Morris) and what Deke Leonard called the ‘Hampshire Border Raiders’ – ie the Helps plus associated musicians. The double LP was promoted with the ‘Happy Days’ tour – the most consecutive number of gigs the band ever played. A second John Peel session was recorded on 10 April, 1973 (broadcast on the 17th). Recorded at the same studio as the first session a year earlier, the songs recorded were ‘Amy’, ‘Blown Away’, ‘Who Killed Paradise’ and ‘Man, We’re Glad We Know You’. Despite feeling despondent, the band made another attempt to record an album in November 1973, going into Chipping Norton Studios to demo six new songs. Sadly, it was not be and shortly afterwards they decided to call it a day. These recordings would later be dusted down by Malcolm for a final Help Yourself album in 2005. For more on that release click here. And as any Help Yourself fan knows, the story didn’t quite end here as the band were invited the following year to take part in a concert at the Roundhouse. A recording of that gig has just been released. Read more about it by clicking here. 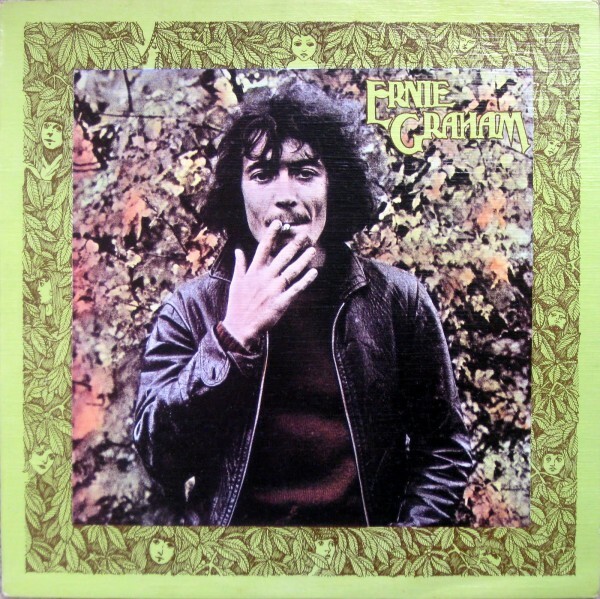 Footnote: in 1971, Ernie Graham invited Help Yourself to assist him in recording his solo album (below). Although the self-titled LP was moderately well-received it sold poorly, prompting Graham to join Help Yourself at Headley Grange.